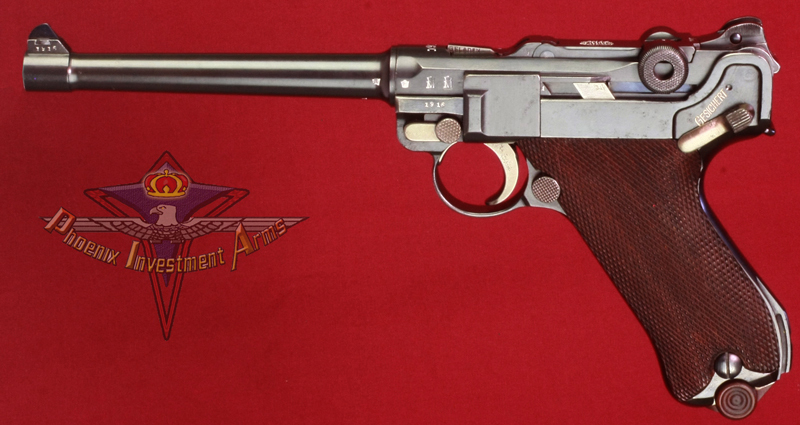 This is a early pistol in the Luger contract series with the Imperial Navy. 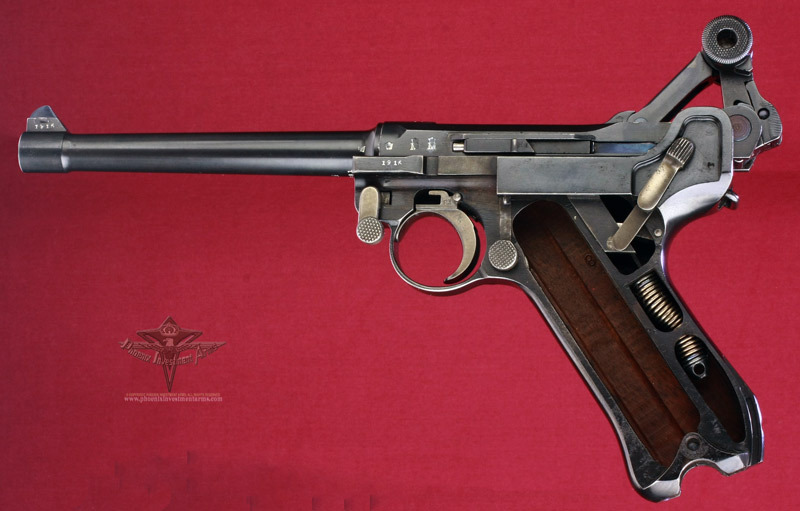 Originally designated the Selbstladepistole Model 1904 by the Navy for the first contract; this is a 1916 DWM (Deutsche Waffen und Munitions Fabriken) dated Navy. 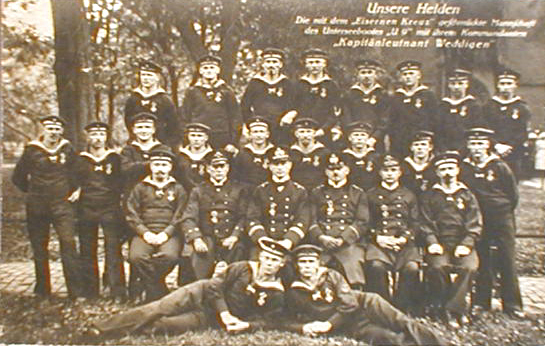 The U.9 was built by Kaiserliche Werft in Danzig. She was launched on 22 February 1910 and commissioned on 18 April 1910.The U-boat was armed with four 50 cm (20 in) torpedo tubes, two fitted in the bow and two in the stern, and carried 6 torpedoes. The boat's complement was 4 officers and 31 enlisted. Fitted with both diesel engines and petrol engines and two battery engines this was cutting edge for its time. 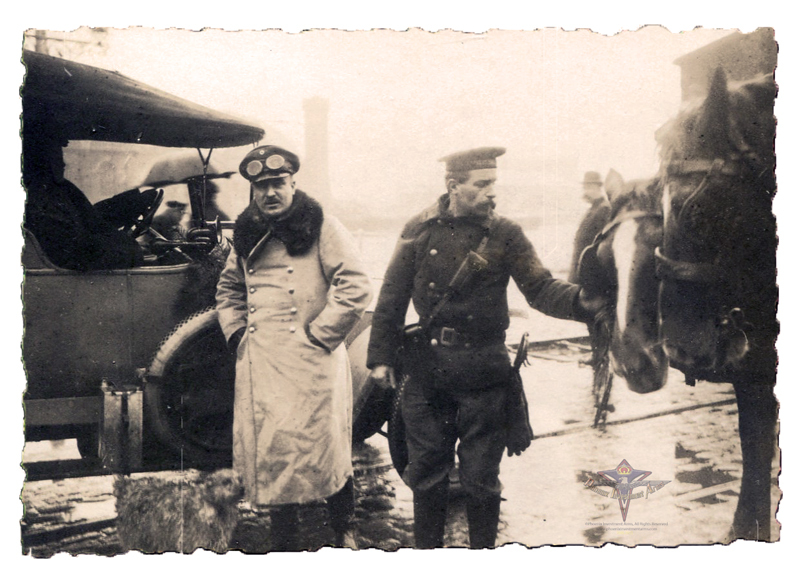 The On 1 August 1914, Kapitänleutnant Otto Weddigen took command. On 22 September, while patrolling a region of the southern North Sea, U-9 found a squadron of three British Cressy-class armoured cruisers (HMS Aboukir, HMS Hogue, and HMS Cressy), which had been assigned to prevent German surface vessels from entering the eastern end of the English Channel. 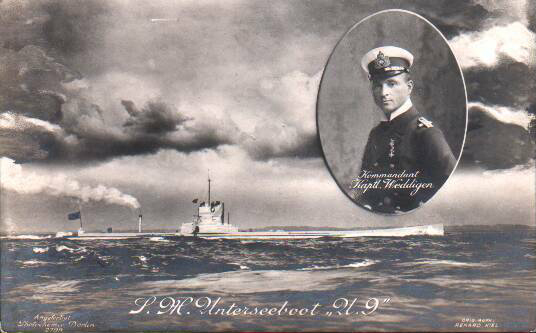 She fired four of her torpedoes, reloading while submerged, and sank all three in less than an hour. 1,459 British sailors died.It was one of the most notable submarine actions of all time. Members of the Admiralty who had considered submarines mere toys no longer expressed that opinion after this event. Serial number placement is in the civilian ("hidden") style. 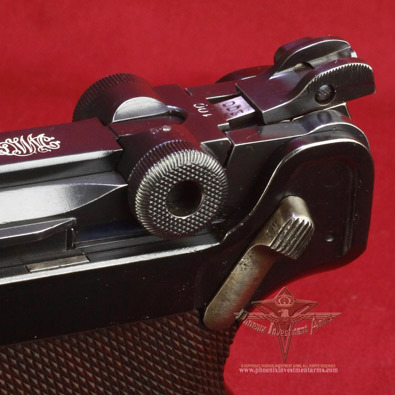 The serial number appears on the front of the frame, on the bottom of the locking bolt, on the trigger, on the bottom of the barrel, the side plate, and under the first toggle, and the thumb safety. This is a very difficult gun to find in any condition. 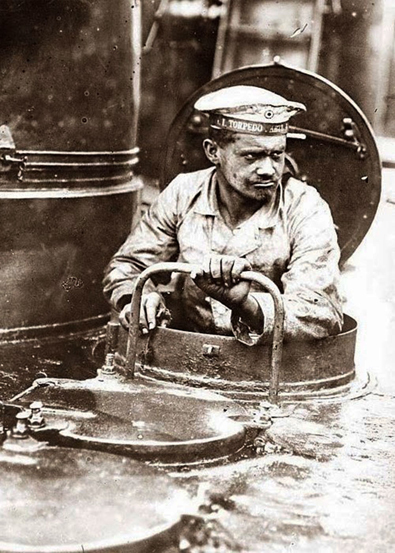 The German Navy was a salt-water service and the survivability of the German Imperial fleet was not enviable. Penned into the North and Baltic sea for duty the Navy spent a lot of time in port. 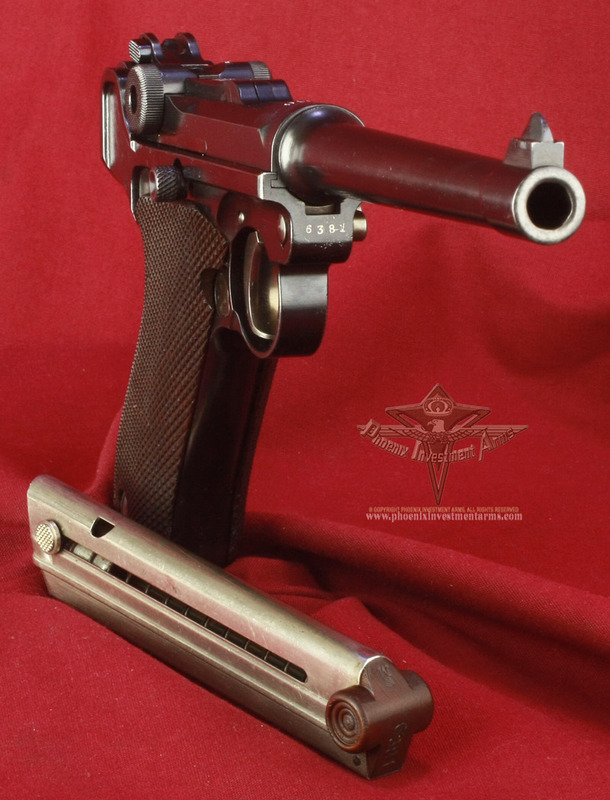 The Parabellums were initially issued with the safety up but then with the 1908 conversion to safety down the Navy recalled all the Luger's and had the thumb safety modified. See Kenyon Lugers at Random Page 152. The Marinen Proof and the 3 digit serial number appearing on the bottom of the barrel and the last two digits of the serial number on the stop lug & on the bottom of the first toggle.. (We have lightened the number for your convenience.) . 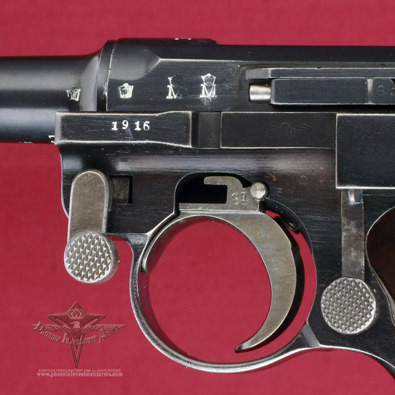 This Luger has all matching numbers. The four digit number is mid-range in the 1916 production range. The magazine is the original with the Marinen Crown Proof and the matching serial number. 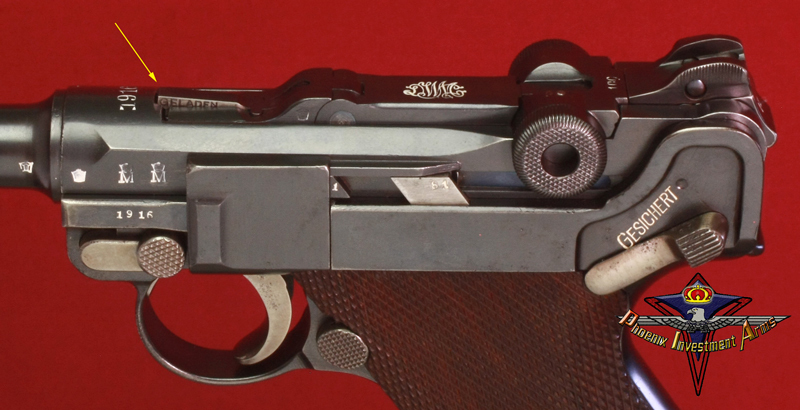 Here you can see the matching serial number of the barrel, the front of the frame, the locking lever and the bottom of the side plate plus the grips are numbered to the gun. The magazine is matching with the Marinen Crown Proof & the matching serial number. The right side of the Parabellum is as clean as a commercial; model without any proofs or stamps (standard configuration on the Navy version). Also seen is the hold-open adjustment knob which has never been reported in any of the research material we have ever seen. 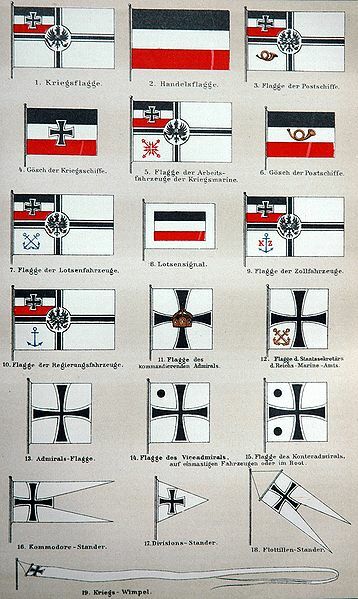 Above Left: The flags of the Imperial Navy from the Kriegsflagge (War Flag) to the Squadron Pennants. 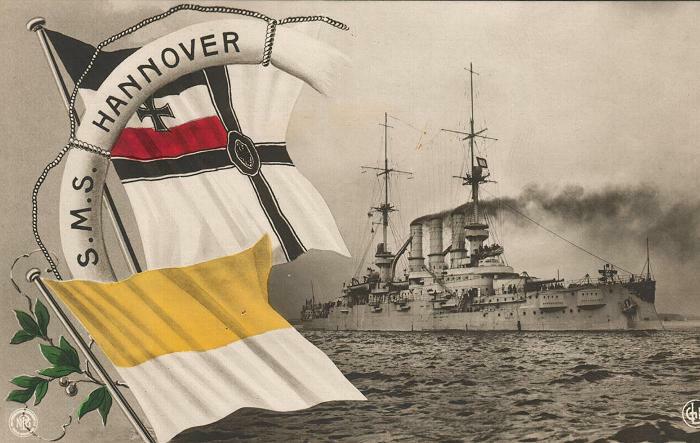 There was a special flag for when the Kaiser was aboard the ship. 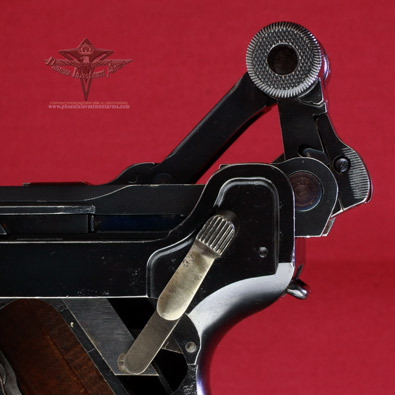 What makes this Navy a very unusual go is the adjustable hold open on the right side of the gun. 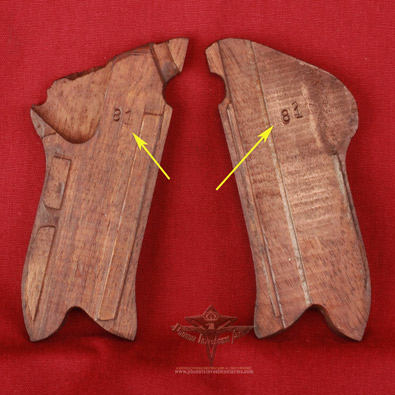 What the purpose of this additional appendage is unknown to the ages; what we can see is that that shooter can raise or lower the hold open to any elevation. The first toggle link is marked with the DWM logo. 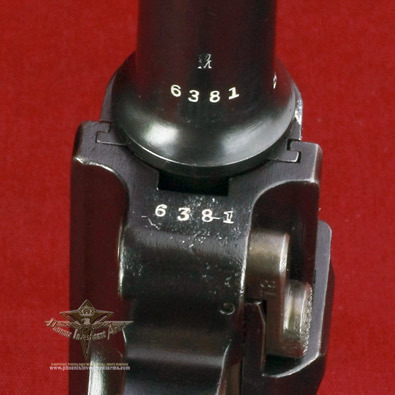 There is the two-position (100-200m) sight on the rear toggle link and the last two digits of the serial number appear on the rear toggle. 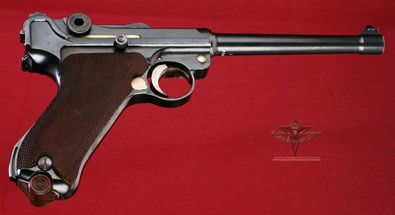 Most of the Imperial Luger's are marked on the right side of the receiver with the Imperial proof marks; the proofing on the "Navy Model" has always been distinctive with the Crown M for Imperial Marinen, the small date on the muzzle and side rail of the frame and the Crown acceptance proof all on the left side. 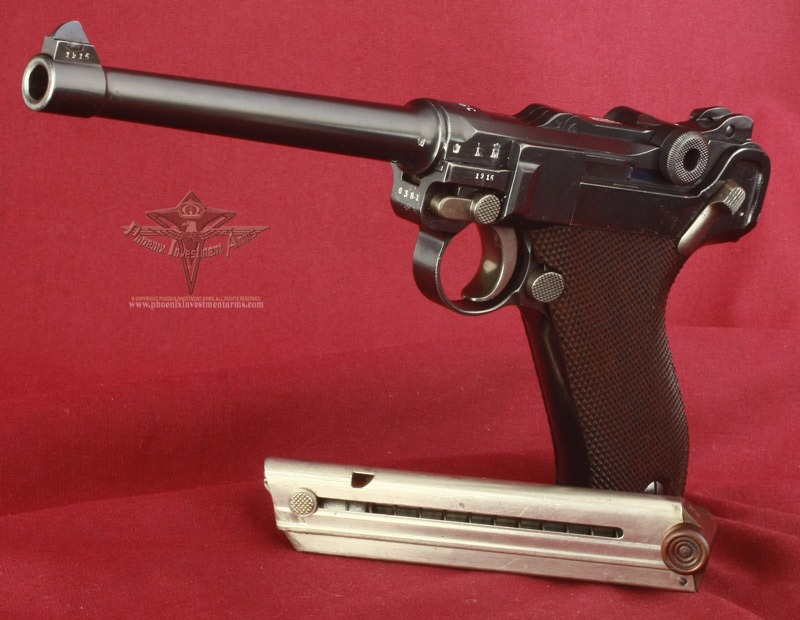 Above Left: This is a post-1914 short sear model that enables the Luger to be cocked when the thumb safety (Gesichert - Above) is in the safe mode. This problem was solved by one of Georg Luger's last patents shortening the sear on later models. 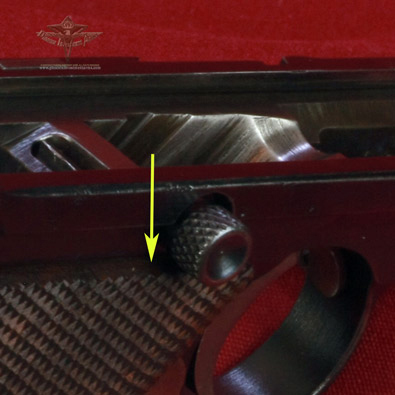 Above Right: The Parabellum in full recoil shows the rear main axel pin that the Imperial Navy ordered to have an enlarged flange to protect it during recoil. This large flange was not adopted by the army. The extractor is marked "Geladen" (Loaded) which not only can be seen but also felt by the shooter in the dark. 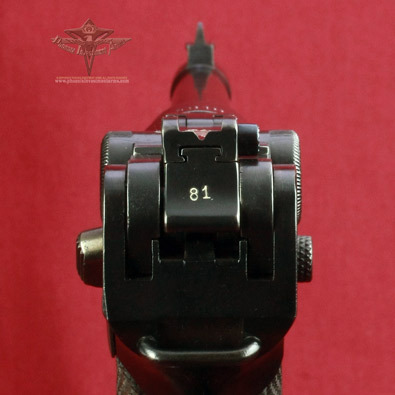 The rear ramp sight is two position for 100 meter and 200 meter sighting. The serial number is on both the short sear and the sear stop. 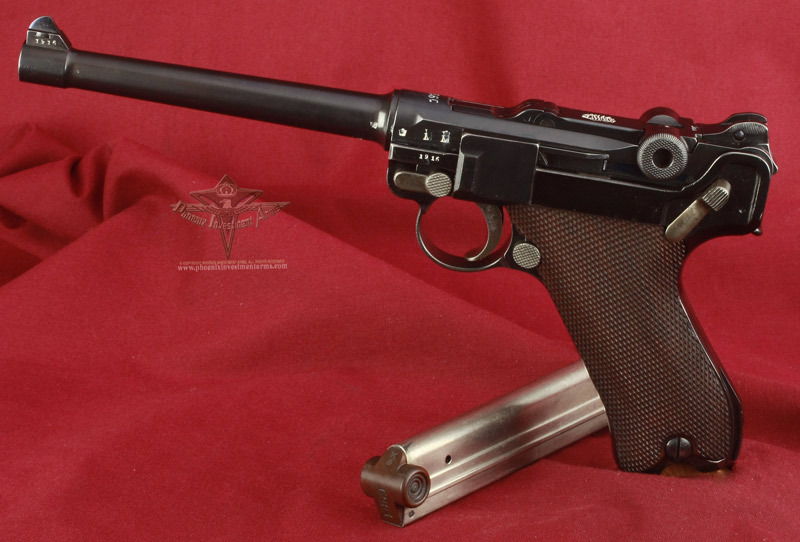 In 1915 Luger shortened the sear so the gun could be cocked without releasing the safety. This Navy is the classic; complete with matching magazine. 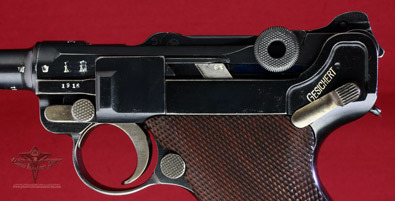 Note below the GELADEN showing the gun is loaded both visually and by feel by the shooter. 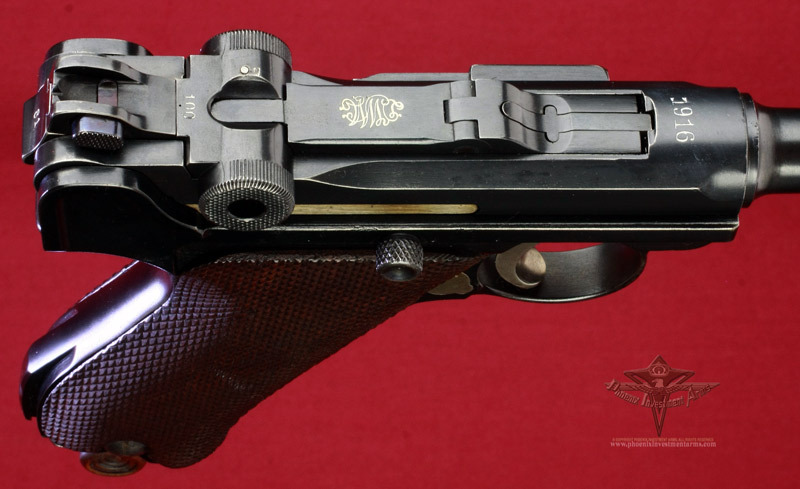 The wear on the side plate shows this gun was holstered most of its service life. The highlight of the rails and wear at the muzzle are further demonstrations of honest holster wear. 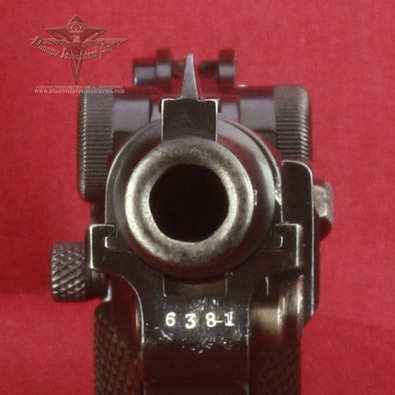 Above: The Navy squeeze-type 200 meter rear sight. This Navy is the classic; complete with matching magazine. The finish shows honest wear and would be rated excellent for an Imperial Navy. 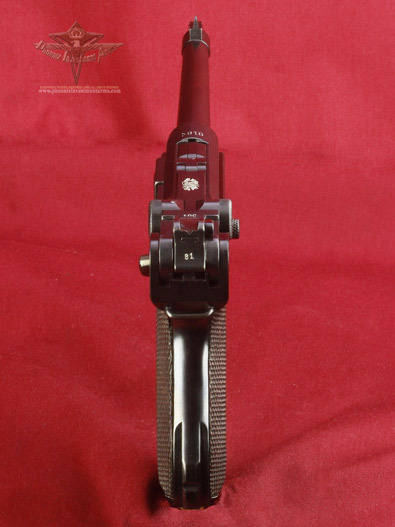 This model has a custom or experimental hold open latch and comes with a stock lug. The 100/200 meter Navy sight. The Navy was issued with a stock and holster similar to the 8" (200mm) Artillery model for the Navy Marines. This is the basic Navy that collectors either add or upgrade into their collections. 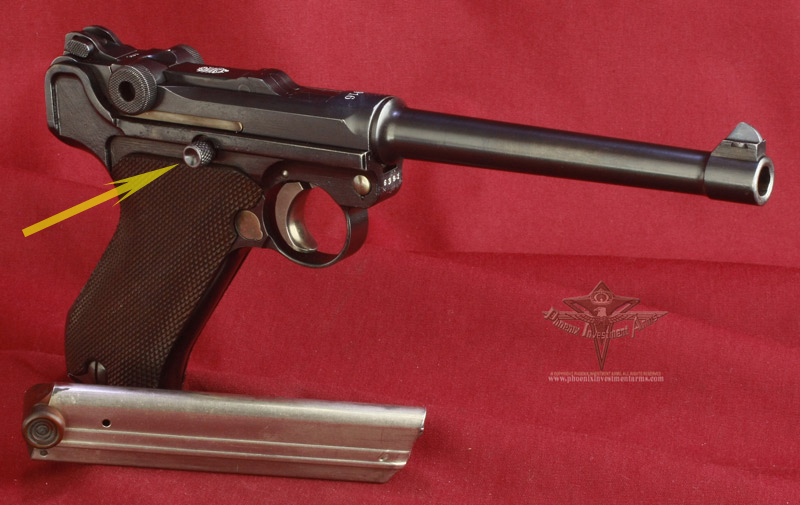 Truly an Imperial Navy collectors classic gun. 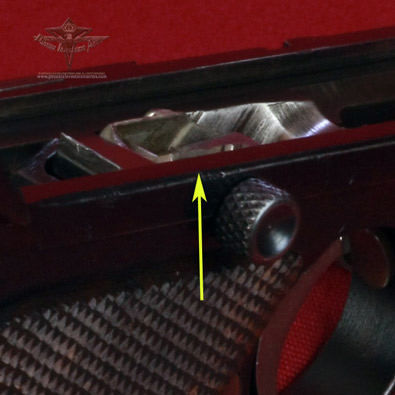 The right side reveals a knob below the ejector which permits that shooter to adjust the height of the hold open. 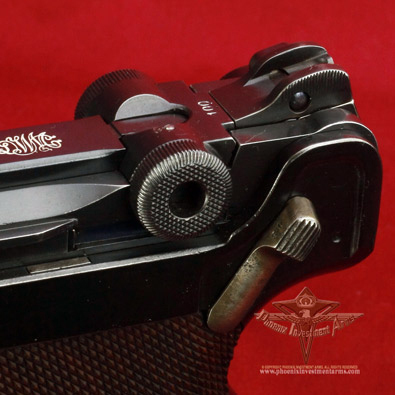 There is no clear path to an answer as to why, perhaps they were experimenting with different multi-round magazines that didn't match the conventional Parabellum extension into the chamber well. 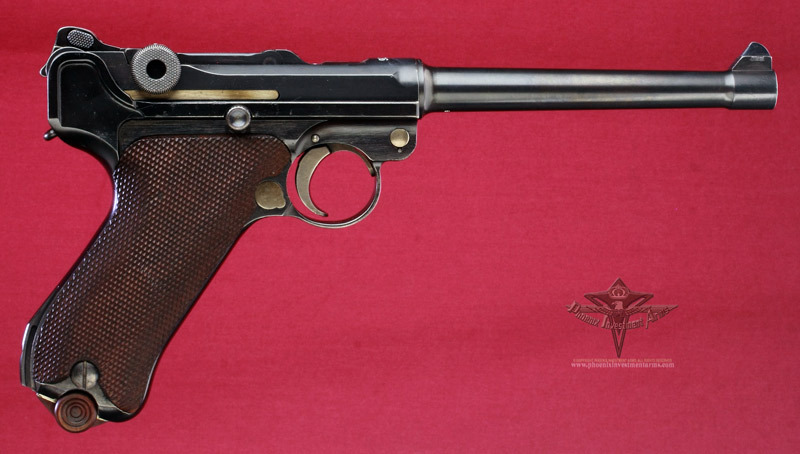 This 1916 Navy has the thumb safety and a stock lug. The German Navy had three dockyards — at Wilhelmshaven, Kiel and Danzig. The last named was of minor importance, at least as a fitting-out yard. The dockyard superintendent (Oberwerst Director) was a Rear-Admiral or captain, and is directly subordinate to the Secretary of State. For instanced a Parabellum delivered to Wilhelmshaven and would have subsequently been assigned to a ship where the ships armorer would have placed a unit number for which it was assigned. 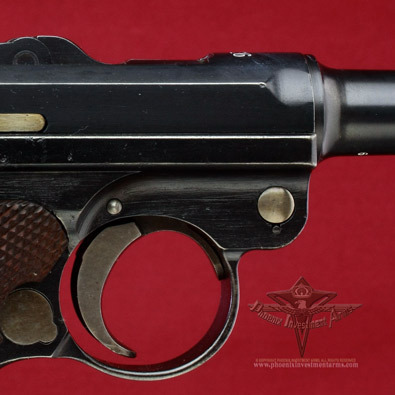 The absence of this number suggest the Luger wasn't assigned but remained at the Werft in storage or this Parabellum was sent directly to the units serving as infantry after the order to cease unit marking the guns. 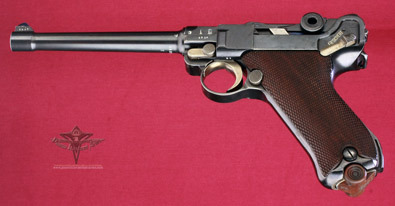 Navy Lugers were always marked in an non-exposed manner as opposed to the Army guns which marked on the face of the side plate and locking lug. Navy Models were marked on the bottom of the side plate and locking lever as they did with the commercial models. Both the sear and safety stop are marked with the last two digits of the serial number. See Kenyon Lugers at Random Page 156. 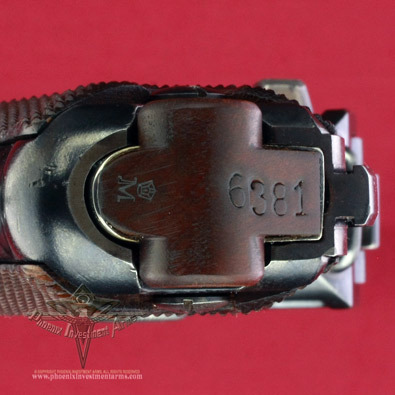 The magazine for this Navy Parabellum is the rolled crimped steal, very clean and functional with the ring wooden bottom and the Imperial Navy proof. 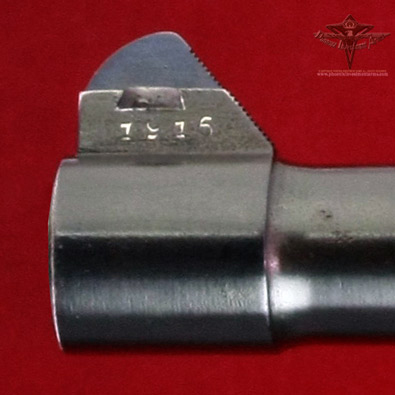 On the front of the receiver is the four digit serial number 6381 indicating that this is the 6,381st Navy Parabellum produced in 1916. The rear toggle has the last two digits of the serial number. 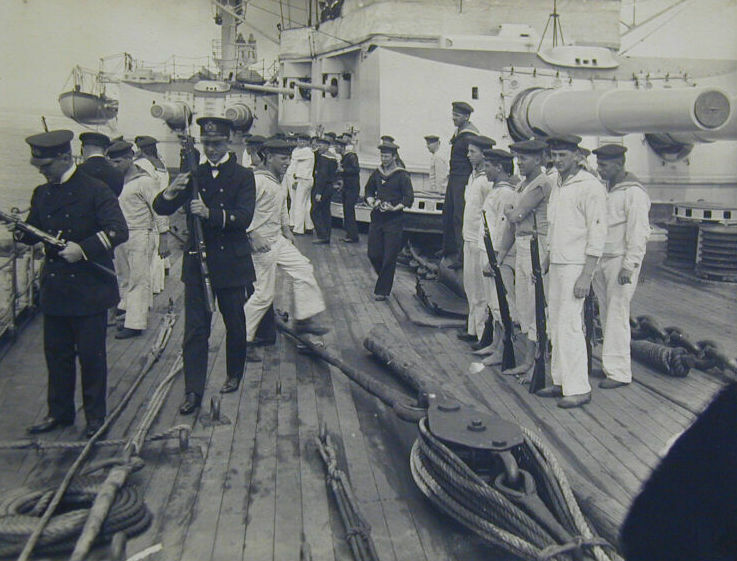 There were only approximately 8,000 1916 150mm barrel Imperial Navy's issued. 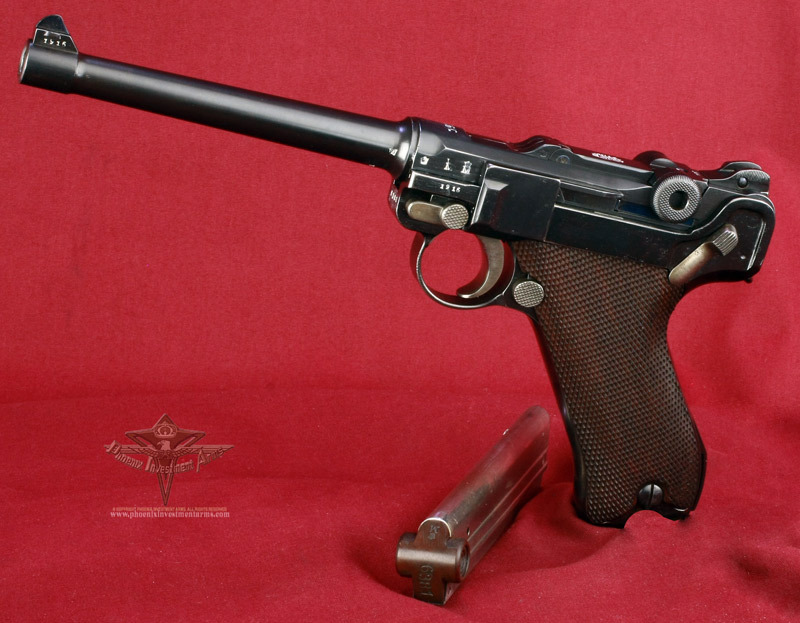 The interior of the Luger is in excellent condition with all the parts matching. 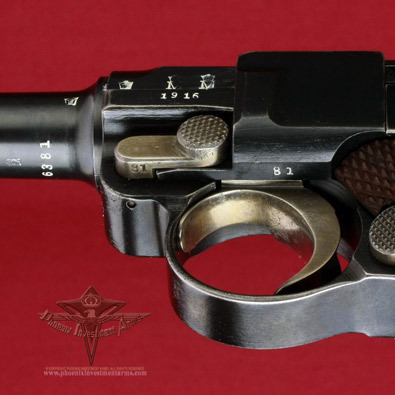 The Luger is shown in full recoil and one can see the rear main axel pin and the Imperial Navy proofs. By pushing the thumb safety up we can see where the sear stop can be engaged and moved down to permit the sear to function. 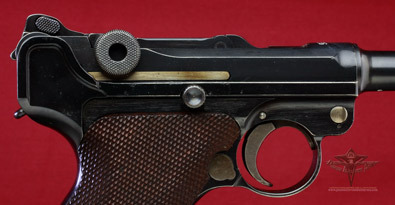 The Altered and Second Issue 1906, 1908, 16-17 Navy Models show a clean space under the thumb safety meaning it was ready to fire. 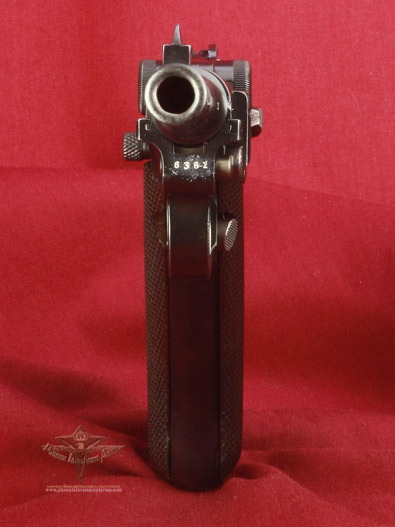 This perhaps an experimental or one-of-one test model shows the adjustment of the hold-open to the lower position with the magazine removed. The above right show the button full up pushing the hold-open to the top of the device to stop the breach block from moving forward. The 1916 -18 Imperial Navy put the date on the site band and on the front left rail of the frame. No particular reason can be found for this practice but it is characteristic of all these models. There are no import marks on the WWI marked Navy. 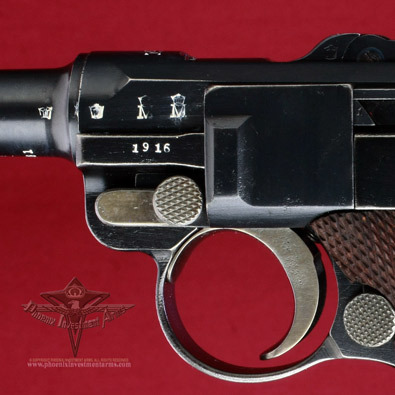 This 1916 DWM Navy and is in very good- excellent condition and offered for $6,895.00 over the counter. This Parabellum doesn't show a standard holster wear pattern and a strong shiny barrel. 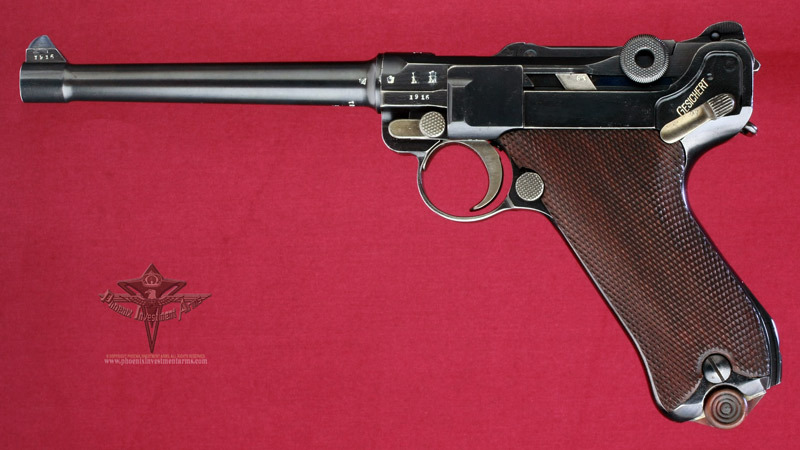 It is believed this extraordinary hold open device set this gun aside as 'test gun' and spent its life in a safe. This gun may be sold before being posted as such on the internet. We reserve the right to sell any internet offering to a direct sale and no not warrant the availability of any firearm that does not have a physical deposit. This gun may be withdrawn without notice for in-store sale. Call for availability.